The fan patch creates a Windows NT-compatible executable file called ig2nt.exe. This should be the target of any shortcuts. This game runs well with dgVoodoo 2.55.4 in 1080p resolution with anti-aliasing. You must set these in dgVoodoo and leave the game's resolution on 1024x768. This method avoids the black video bug. Many cinematics in the campaigns play only the sound (most notably the introductions). Multiplayer. But the guide linked earlier mentions it's possible if you ensure windows firewall is disabled. Apparently multiplayer will work with any of the four disks. The game will crash on certain screens (fleet info, design, scenario select, etc.) if the display aspect ratio isn't 4:3 in the ig2.ini file. Perform this step again whenever setup.exe is run. Right-click on the game shortcut. From the pop-up menu which appears, select Properties. 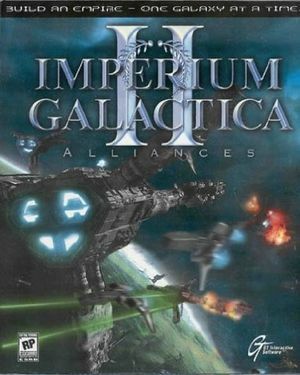 Change the value of Target: to %WINDIR%\System32\cmd.exe /C START "Imperium Galactica 2" /normal /affinity 1 "C:\Program Files (x86)\Digital Reality\Imperium Galactica 2\ig2nt.exe"
This fix assumes the patches are installed. The new value for Target: assigns the game the first logical core, core 0. To use another processor, change /affinity 1 to another value, such as /affinity 2 to use the second logical core, core 1. The game sometimes hangs if it needs to change disks to load a specific campaign. ↑ 2.0 2.1 When running this game without Administrator elevation, activity in %PROGRAMFILES%, %PROGRAMFILES(X86)%, and %WINDIR% might be redirected to %LOCALAPPDATA%\VirtualStore\ (more details). This page was last edited on 30 March 2019, at 06:54.